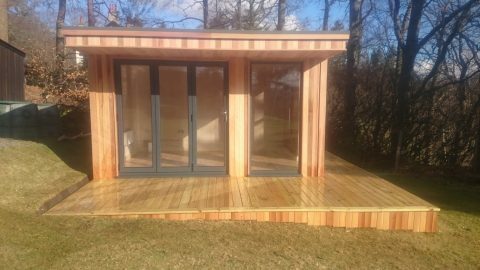 A summerhouse is not only a useful thing to have, but with the right design it can become a beautiful focal point for any garden. 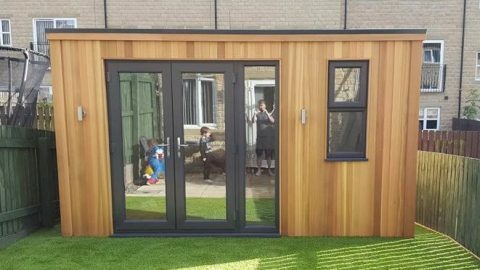 Siobhan from Ashford in Lincoln had an attractive and well-established garden with a walled, raised area at the far end, which was just shouting out to have a new, stylish garden summerhouse built on it. 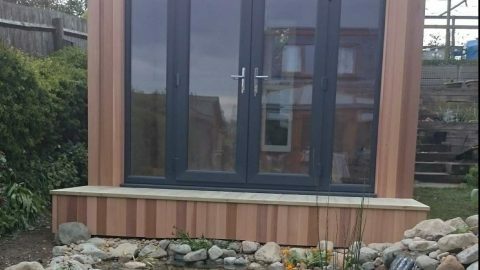 Being careful not to detract too much from the beauty of the natural landscape, we worked with her to provide a modern garden building which would suit both her family and her garden. 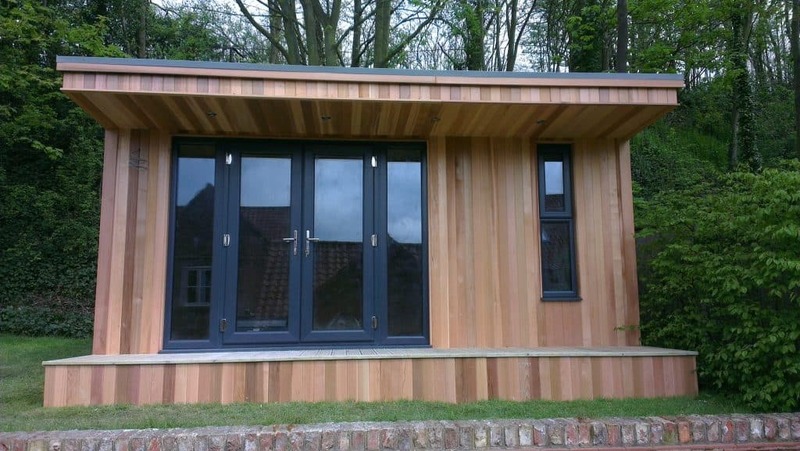 This build was a 5m x 4m Canopy Garden Room with natural cedar timber cladding. The room had a one metre canopy with downlighting, and decking to the front. Two large French doors with sidelights and two windows were installed. 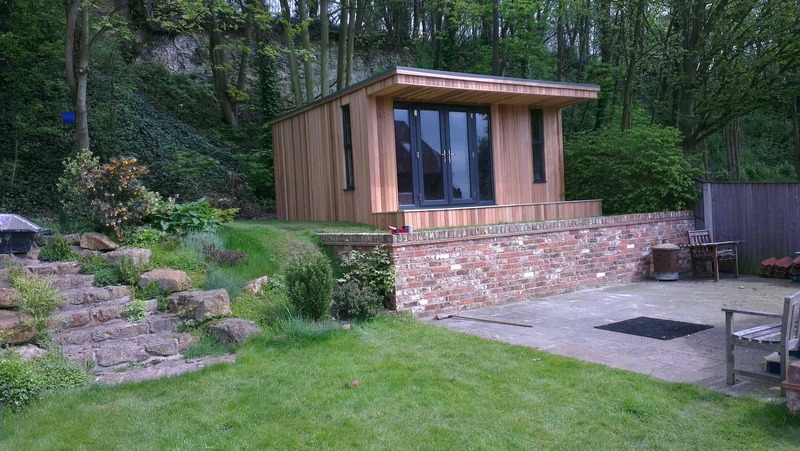 This garden room would be nestled at the end of Siobhan’s garden, in a shady spot among ferns and shrubs. 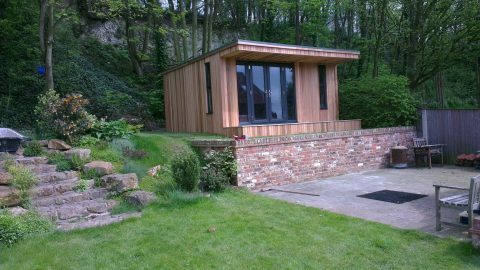 With a backdrop of cliffs and verdant greenery, this garden room needed to fit in, complementing the landscape with natural materials. 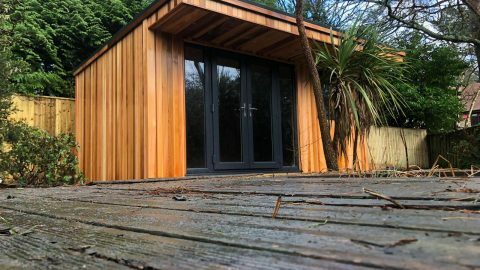 Although the summerhouse needed to be a practical space, it also needed to look stunning as being raised from ground level, all eyes would be drawn towards it! We suggested a Canopy Room would be the right fit for the raised, shady area at the end of the garden. 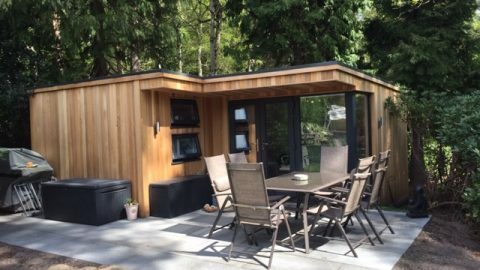 Partially enclosed by a 1m canopy and matching decking below, the look of the build suited the surroundings as well as providing a little privacy to the summerhouses’ occupants. 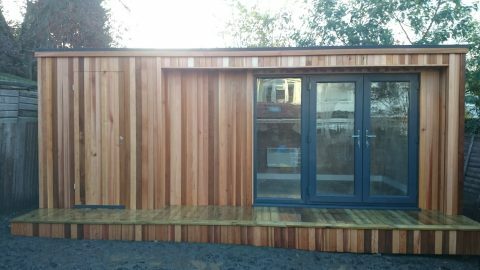 To make the most of the space available, the 5m by 4m building was stretched to the rear and right hand borders of the garden. 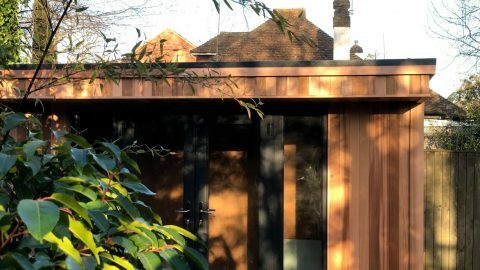 It was clad in natural cedar which in time would dull, fitting in with the wooded area behind it. Large glass French doors and two windows to the front and side were sited to allow as much light in as possible although electricity was run to the building to allow for lighting. 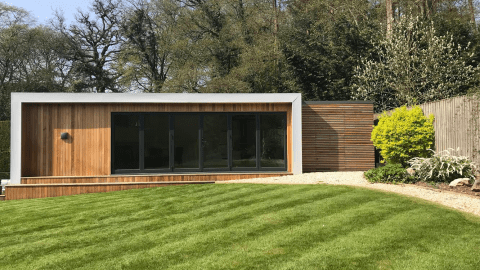 We think that this modern summerhouse build suited the space perfectly, creating a stunning, stylish and complementary focal point for the garden as well as providing a large amount of useful space for the family.